Alfred Hitchcock once referred to the swamp scene in Psycho – where Norman Bates attempts to sink the car containing Marion’s body – as an example of the viewer being made (at least temporarily) complicit in the carrying out of a morally undesirable act. In the long, intense, wordless sequence before this one we’ve watched Norman, a likeable young man, meticulously cleaning up traces of a murder committed by his vicious mother; if we’re really involved with the film at this point, chances are that we acquire something of an emotional stake in his efforts. So we want the swamp to swallow up the whole car. Besides, wouldn’t that be a good way to get the plot moving forward? There are even better instances of such audience manipulation in other Hitchcock movies (Rope and Strangers on a Train among them) but for an example of a whole film that creates this effect, you probably need to watch one where nearly all the characters are crooks or wannabe crooks. 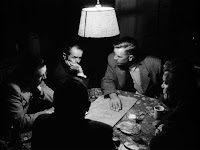 Like Stanley Kubrick’s solid 1956 thriller The Killing, about a group of men carefully planning a racecourse heist, a plan that then begins to unravel on different levels. The Killing is a very economical film with hardly a wasted shot, and given its short running time, it’s notable that even the minor characters are well-defined. (Key example: the Russian wrestler Maurice, who delivers an interesting monologue about gangsters and artists being the same in the eyes of the masses. "They are admired and hero-worshipped, but there is always present an underlying wish to see them destroyed at the peak of their glory.”) The narrative isn't chronological; instead, a fatalistic voiceover details the movements of different people at different times, in the style of a newsreel documentary. This technique feels a bit gimmicky at times, but it creates a sense of urgency and dread, and it fits the theme of each character being like a small piece in a jigsaw puzzle, vital to the successful completion of the project but unable to see what the larger picture will look like (an analogy that is explicitly made in an early scene). The one person who can see most of the puzzle is the plot mastermind Johnny Clay (played by Sterling Hayden, an underutilised actor), but even he spends much of the film on tenterhooks, clearly aware of everything that can go wrong. And sure enough things start to get messy, not all at once but in small increments that accumulate dangerously. There are little miscommunications and errors in timing (how did people ever carry out heists in the days before cellphones?). A man hired to shoot a racehorse in order to provide a distraction finds himself pestered by an over-friendly parking attendant. Most crucially, one of the conspirators, a mild-mannered racecourse clerk, tells his wife about the scheme in a weak moment, and she passes on the information to her young boyfriend. Not everyone in the group seems to understand that to live outside the law you must be honest. All of this leads to a superb climactic scene set at the airport where Johnny and his girlfriend are trying to make a getaway. I won’t give away the scene, but it’s a real lesson in how to build tension by putting a number of different elements in place beforehand (a large suitcase stuffed with dollar bills; an official who’s a stickler for the rules; a talkative woman and her yappy little dog; a plane taxiing onto the runway, its giant propellers whirring) and then combining them for a knockout punch. If you admired the way Johnny and his associates planned and executed their operation, this ending is a real heartbreaker too; the Scene Selection menu on my DVD labels the track “Crime doesn’t pay”, but just for a few moments you wish it had. 'The Killing' is my favourite Kubrick film, among the half-a-dozen I've seen. The most common criticism of Kubrick is that his films lack a heart. The Killing is an exception in this regard. The movie is very successful in describing the compulsions of the various participants. Many of these minor characters are quite memorable unlike the prosaic men who usually populate his films. Characters like the Russian wrestler, the hen-pecked husband and Johnny's unattractive girlfriend can easily fit into a Douglas Sirk melodrama. Sterling Hayden connection fascinating. While i remember thinking that the title seemed very similar to 'Johnny Guitar', i couldn't find any similarities beyond that, so figured it was just a coincidence. Agree with Shrikanth above. The story is told in a very clinical style but it is also heartbreaking, something that is unusual for Kubrick (may be with the exception of Barry Lyndon). Sterling Hayden's character is mostly monotone (like most noir-heroes), may be that's what you mean by saying that he was underutilised, but he has an amazing presence on screen. His role in The Asphalt Jungle is similarly tragic and heartbreaking. And the guy who played the wrestler was a wrestler and a chess player in real life too. I watched this movie around two months back. This film is quite an exception because it doesnt feel like a Kubrick movie. The end is heartbreaking and you feel bad for the crook. The viewer would rather want him to have the money since he pulled of the heist with perfect planning. I have to say that unlike all the previous commenters on this post, I didn't find The Killing heartbreaking at all. I personally thought the film was hilarious and chuckled my way through the ending. If I had to pick Kubrick films that were heartbreaking I'd pick Full Metal Jacket. Or Paths of Glory. Or, come to think of it, Clockwork Orange. Falstaff: you insensitive lad! But come to think of it, "heartbreaker" might be an overstatement...I did have a sinking feeling as the film drew to its close though, and Hayden's stoical "Ah, what's the point?" was very effective. I'm finding it difficult now to think of Kubrick moments that can qualify as heartbreaking. Possibly the scene in the rain in A Clockwork Orange, with Alex staggering to the gate of the writer's house and the voiceover "It was Home I came to brothers, not realising where I was and had been before". shrikanth: But the treatment would have been very different in a Sirk, no? And I thought Johnny's girlfriend Fay was quite pretty, in an anti-septic sort of way. Unless you're talking about her colourless personality. Alok: by underutilised I meant simply that he was good enough to have had a more high-profile career and to have starred in at least 3-4 more films of Asphalt Jungle-like stature. Mayank: yes, this film has a quality that later Kubrick films didn't, but I can't quite put my finger on it. Maybe the later films were cooler and more detached. I'm finding it difficult now to think of Kubrick moments that can qualify as heartbreaking. Really? You didn't think this was heartbreaking? Or this? Seriously, though, Paths of Glory, agreed, but for some reason the second half of Full Metal Jacket did nothing for me. Can't figure out why. shrikanth:And I thought Johnny's girlfriend Fay was quite pretty, in an anti-septic sort of way. Unless you're talking about her colourless personality. Yes. She was rather pretty. Though she regards herself to be very commonplace which is why she clings on to Johnny lest she might find no one else. questions his wife is hard to beat for sheer melodramatic appeal. Delon dumps the bag with the money in a swimming pool to avoid detection and they are lounging near the pool as the police is around and slowly currency notes starting coming to the surface of the pool one by one. That is indeed heartbreaking. Coming to think of it, I think the ending in 'The Killing' is somewhat inspired by a similar ending in the John Huston classic 'The Treasure of Sierra Madre'. Also, the predictable endings (i.e the hero not getting the treasure) in the early heist/treasure hunt movies can be attributed to the Hays Code which precluded a successful heist.